Welcome to my comfort-for-bereavement store! Right now I only have a couple of items listed for sale. 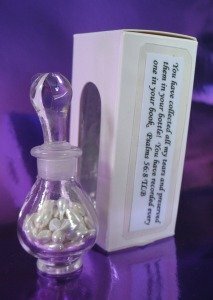 Psalm 56:8 "You have collected all my tears and preserved them in your bottle! You have recorded every one in your book." This bottle measures 2 1/2“H x 1“W. It comes in it’s own box with a clear arch shaped window that measures 3 1/2“H x 1 1/2“W x 1 1/2“D. Included is a laminated copy of Psalm 56:8. Click on this link to read my personal story of how the teardrop bottle came to be. I want to share this teardrop bottle with you. It is a tangible gift that you can place into the hands of a grieving loved one. Other items in the comfort-for-bereavement store are the lyrics and music CD for the well-known poem by Steve Perry "If You Knew". Steven was inspired to write this song by an encounter that he had with a former classmate. The style to the music is old-time gospel. Now also included on the CD is the song "It's Okay". "If You Knew" by Steve Perry, sung by Doug Hodges. "It's OK" by Steve Perry, sung by Jeff Lane. "If You Knew" is also available as sheet music - Paper copy or as a PDF. Please take careful note! Hard copy versions are marked by the BLUE box, while the computer versions are available for purchase in the GREEN box! "If You Knew" was inspired by an encounter that Steven had with a former classmate. It is a moving account of just how he came to write this song which has become a best loved poem. Click here if you wish to read it. The CD has 4 tracks, If You Knew and It's OK.
Poem written by Russell Underwood, music written by his grandson Andrew Bieker, words and chorus adapted by his son Tim Underwood. You can purchase this song through E-junkie for my cost of $.99. Ron Tranmer has put together 84 poems for the grieving heart including his famous poem “Broken Chain”. Available here for sale by special permission from the author at a sale price of $15.95 ($4.00 off the cover price plus $2.50 shipping). I have an e-book for sale which includes four personal stories of grief. My $1.99 e-book includes the following four stories. Marilyn Evans writes about her experience of losing her teenage son. Richard's (name's have been changed) story is a raw personal account of one young man's experience as he loses his father to cancer. A young widow's story of losing her husband first to mental illness then to a violent death. An older man experiencing his mothers love as she nears death. Below I have gathered together a few items as additions to my comfort-for-bereavement store that were chosen by me according to quality and the philosophy of this site. I am just getting my shop going and plan to add more items in the future. I welcome your feedback and ideas. You may contact me through my Contact Me page.